You might be ready for a break from your flower beds once winter arrives, but why not grow some delicious edibles while the rest of your garden is snoring? It doesn’t take much work or much space, it’s a lot more interesting than pruning roses, and the rewards are great. In fact, a few late fall nights of 28 degree temperatures produce super sweet-tasting cool season edibles! Chances are pretty good that you have room in your garden to tuck in a few Swiss chard starts or leafy braising greens. These types of edibles remind us that in our gentle climate we can have beauty – and food – in our gardens year round. 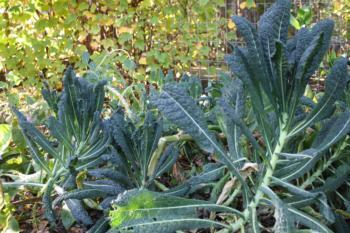 Kale is an easy winter crop that also adds color and texture to the garden. There are plenty of edibles that you can plant in wintertime, including garlic, leeks, onions, radishes, lettuce, peas, potatoes, chard, spinach, rhubarb, and other leafy greens such as bok choy and kale. If you've already planted these yummy treats, then you can harvest them straight through winter. • Select edibles that germinate in soil temperatures between 40 and 60 degrees and mature quickly, such as those listed below. Garlic – Set out nursery-purchased bulbs (separated but unpeeled) four inches apart. Don’t water them in. It’s best to wait until shoots poke up before watering for the first time. Better yet, let the rain water them for you. Garlic requires very little room or attention.